The journey to Haines from Skagway was simply wild – the wind was being squeezed through the channel on the Lynn Canal and was moving unoccupied deck chairs on the ferry toward the back of the observation deck, and eventually sent us below for cover! We pulled into the Chilkoot River Lodge an hour and a bit later, checked out the room and were quite happy with what we found. The real surprise though awaited us when we went through the patio door at the back of the room and were in complete awe – we had a front row seat to the real Alaska! The lodge sits on a slope with a perfect view of the Chilkoot River below. From the patio of our room, we could see salmon fishermen, eagles, and the evening excursions of a grizzly bear and her cub. Our first full day in town started with us checking out the scenery along the river right outside the patio door of our lodge, as well as taking a short drive up to Chilkoot Lake to watch a kayaker, and a fisherman who seemed to be catching a salmon every 10 minutes! We also went into town to get some basic necessities taken care of (read “laundry”), as well as reload on some groceries We were happy to discover Olerud’s who happened to have a very big display of produce, and some very enticing steaks that would look just great on the BBQ back at the lodge. 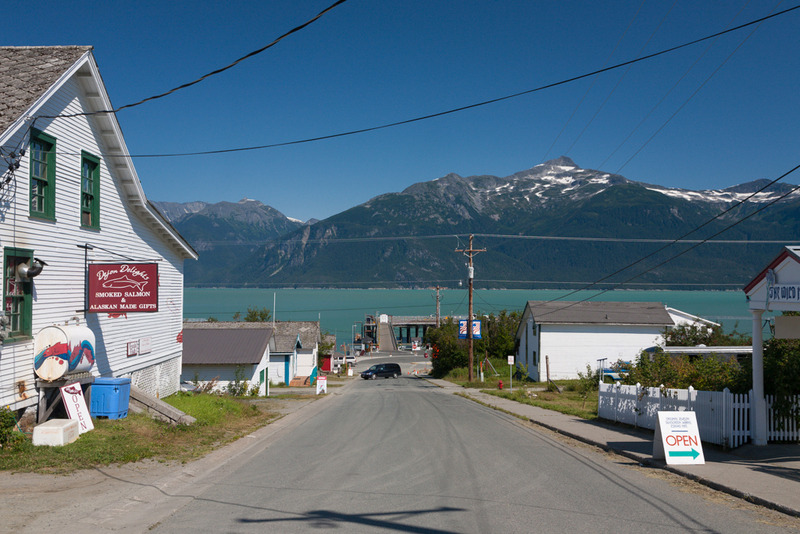 That afternoon, we rented bikes from Sockeye Cycle and toured around the town site, taking in Fort Seward and spending some time checking out the crafts at the Sea Wolf Gallery. We also meandered along Beach Road and stopped at a few parks. This was an easy going day that allowed us to get some basic chores done, and visit Haines on an unstructured basis. The second day involved a fast ferry trip to Juneau with Alaska Fjordlines. The brochure referenced wildlife viewing along the way, but we were treated to something that went far beyond our expectations (seals, porpoises, humpback & killer whales were all on display). The entire day felt like we were being cared for personally, and not being dished standard corporate fare. Juneau was a pretty place to visit, and we also seeing the Mendenhall Glacier, but the highlight of the day was the journey to/from Juneau. We missed out on opportunities to hike either Mounts Riley or Ripinsky both of which would have afforded excellent views of Haines and the Lynn Canal. We enjoyed our stay in Haines, and were looking forward to the adventures, and big scenery, awaiting us in Haines Junction, Yukon. You can read more about our journey along the Golden Circle Route here. Thanks for the pics! It was a good reminder of home.